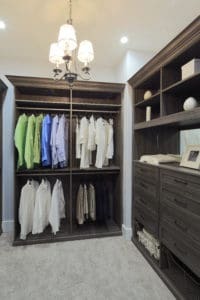 You have finally decided to get your closets designed and have a custom closet made just for you. The only problem is that you are on a budget and you are not sure what must haves are needed to make sure your closet fulfills your every need. Well, we here at SpaceMakers Closets are here to help you make that decision easier. 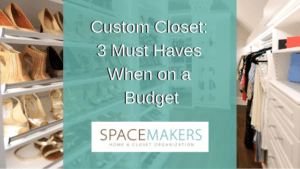 Here are the top 3 must haves you need in your custom closet when you are on a budget. The #1 cause of clutter in your closet are shoes on the floor. You would be surprised the difference it makes by simply having a space for all your shoes. By clearing off the floor, you’re opening up so much space in your closet system. The floor will no longer be a sore spot when entering the closet. Having shoe shelves is a must have when creating your custom dream closet. A typical closet system contains a wire rack that goes around the entire closet. Although it may seem spacious, the truth of the matter is that this design wastes alot of space. Simply adding a second row of closet rods and limiting the amount of single/long hang to more fully utilize the available space will make a huge difference in your closet design. You will have more useful space in your closet than you ever thought possible. Having cubbies or shelving in your closet adds more useful space for all your clothes. By adding this to your custom closet, you will have a section for all your bulky items (sweaters, etc.) which will give you more space for that wonderful new double hang area for your shirts. This area in your closet is a must have because it will enhance the overall usage of space and appeal of your closet. If there is a little wiggle room in your budget, then you will most definitely want to add some drawers. 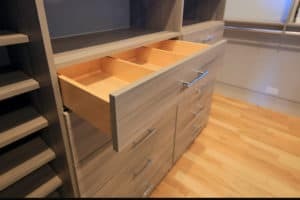 Not only does adding drawers give you more space, it also enhances the getting ready process. Normally when you get ready for the day, you are zig-zagging throughout your room from your closet to your dresser. By having drawers in the closet, you have everything in one area. 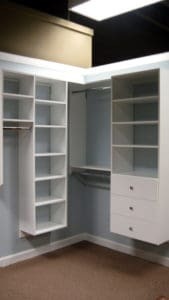 Getting your dream custom closet made just for you does not always mean having to spend a ton of money. There is a way of getting everything you need to stay organized and efficient, all while staying within budget. I hope our tips help you on your journey of creating your dream home.